Although it may seem unthinkable, senior citizens can be victims of Illinois nursing home abuse. Abuse in an Illinois nursing home can take a variety of forms, including neglect, emotional abuse, physical abuse and sexual abuse. Nursing homes in Illinois must provide proper care to residents, including providing residents with a safe place to live, free from abuse on the part of staff, other residents or visitors. 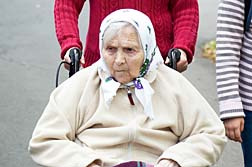 Nursing home abuse in Illinois includes Cook County nursing homes and Chicago nursing homes. Send your Illinois Nursing Home Abuse claim to a lawyer who will review your claim at NO COST or obligation. Illinois nursing homes are licensed, regulated and inspected by different agencies including the Illinois Department of Public Health (IDPH) and the US Department of Health and Human Services' Centers for Medicare and Medicaid Services (CMS). Illinois nursing homes are required to meet mandatory Illinois state standards of care. When an Illinois nursing home violates states regulations or does not comply with state nursing home standards, the nursing home may be subject to a fine or other enforcement actions. Chicago nursing homes account for the majority of nursing homes in Cook County. There are currently close to 1,000 nursing home facilities in Cook County. The Chicago nursing homes alone represent over forty percent of all the Cook County nursing homes. Chicago nursing home abuse can include emotional, physical or sexual abuse. The perpetrator can be a staff member, another resident or a visitor to the home. Illinois nursing homes and Chicago nursing homes are required to provide the highest care possible to residents; failure to do so can be devastating for the victim and her family. Emotional abuse at a Chicago nursing home includes yelling at the patient, swearing at the patient, threatening the patient, and intimidating, harassing or humiliating the patient. Signs of emotional abuse include personality and/or behavior changes, emotional withdrawal, self-abuse or self-deprecation and emotional sensitivity. Physical abuse in Illinois nursing homes, including Chicago nursing homes, involves the intentional use of physical force when that physical force could result in personal injury or pain. Illinois nursing home physical abuse can involve striking the resident, force feeding the resident, pushing or shoving the resident, shaking or slapping the resident and mishandling the resident while transporting him. Signs of physical abuse include unexplained injury, unexplained change in behavior and unexplained negative reactions to certain staff members. Sexual abuse in Chicago nursing homes involves non-consensual sexual contact with a resident of the nursing home. Signs of sexual abuse include personality or behavior changes, unexplained injury and withdrawal when certain people are in the room. Residents in nursing homes are vulnerable to abuse. Unfortunately, not all Illinois nursing home residents survive their abuse. In such cases, the family members of the victim can file a wrongful death claim against the nursing home. Wrongful death claims against a nursing home can include allegations of negligence, medical malpractice and personal injury. Those Illinois nursing home abuse victims who survive their abuse may require additional medical care, rehabilitation and therapy to overcome the abuse. An Illinois nursing home abuse lawyer can help determine what action should be taken against the nursing home in Illinois. Nursing Home Workers Sentenced in Nursing Hom..
Troubled Illinois Nursing Home Under New Mana.. Nursing Homes in Illinois House the Elderly w.. The nursing home would keep me on hold and hang up on me when I tried contacting grandmother and she would feel rushed to get off of the phone. Grandmother would beg for me to come and get her from the nursing home. Emotional and psychological abuse was present and she became more secluded and withdrawn. Grandmother would constantly go into the hospital for falling at the nursing home. I am emotionally distraught because I did not have power of attorney to remove her from nursing home before she died.